In January, DWS Auto had carried a report that talked about Nissan’s plans of launching 3 small cars in India, codenamed K2, I2 and K11, in the next 3 years. The latest news is that the small car will be positioned below the Micra in its Indian portfolio. Tokuyama added that the company is eager to capture the small car market in India and, hence, will put the concept model into production soon. Currently the Micra, launched in India by Nissan last year, is the only small car from the Japanese car maker. Nissan sells around 2,000 units of the Micra every month via its wafer-thin 30 dealerships across the country. 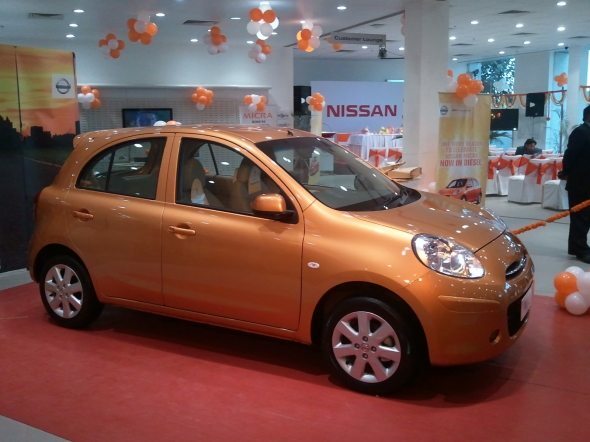 Nissan rolls out the Micra from its Oragadam plant near Chennai. The 1.2-litre petrol engine used in the Micra is also manufactured here. The NV200 will have power steering, rear leaf springs (in the Indian version) and massive cabin space, thanks to its height, which will make it stand taller than the Toyota Innova. The seven-seater version is what we expect to launch in India. Upon launch in 2012, the Nissan NV200 will have to face stiff competition from the upcoming Maruti Suzuki’s RIII MPV, which is expected to be launched by the end of 2011. Nissan sells the X-Trail SUV and Teana sedan through the CBU (Completely Built Units) channel or, in other words, these models are fully imported from Japan and hence they command a high price tag. Nissan had been planning to assemble the X-Trail in India, which would have helped it bring down the vehicle’s price. However, a new provision announced in the 2011 Union Budget threatens to impose additional burden on car makers who import pre-assembled parts. In case the rule is enforced, auto-makers will have to shell out a customs duty of 60%, which is the same they would pay for importing cars. SIAM is seeking a clarification on the matter from the Indian government and Nissan is keeping a close eye on the verdict. Tokuyama said that in case the decision ruled in favour of OEMs (original equipment makers), Nissan will immediately begin assembling the X-Trail and Teana in India. Update (16/03/2011): The government has just now issued a clarification regarding what constitutes CKD. According to the definition, CKD comprises only those kits with pre-assembled engine, gearbox, etc and not individual components which will attract only a 10% duty. Hence, Nissan (and Toyota, Mahindra, Honda, etc) can heave a sigh of relief and continue importing engines and gearboxes separately.